Brendan Boyce remains hopeful the 50k racewalk won't be eliminated from the Olympic Games. BRENDAN BOYCE COULD do without any serious distractions right now. The two-time Olympian is, it seems, at a pivotal point in his career. The Letterkenny native finished 29th in the 50km race walk during the London Olympics and came 19th at the same event four years later in Rio. 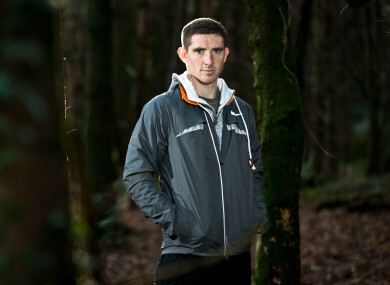 Coached by another man who knows the sport inside out, Irish Olympic bronze medallist Rob Heffernan, Boyce is optimistic that he has genuine medal hopes in Tokyo if all goes according to plan on the day. But for a while now, a problem has been bubbling beneath the surface. As far back as 2017, there has been talk of potentially removing the 50k racewalk from the Olympics. More recently, it seems an increasingly likely outcome. One of the original issues with the 50k was that it existed for men but not women. At other events, including the world championships, they have simply introduced a 50k for female athletes while keeping the male equivalent intact. It was one potential solution in relation to the Olympics too, but instead, organisers appear intent on removing it entirely. Earlier this month, the International Association of Athletics Federations (IAAF) Race Walking Committee approved “in principle” plans to reduce the 50k distance in race walking after Tokyo 2020. In place of the 50k, they plan “to roll out two of the following events – the 10, the 20, the 30 or 35k”. Retired Italian race walker Maurizio Damilano, a 1980 Olympic gold medallist and two-time world champion over 20k, explained the rationale behind the decision. Changes are not always an easy thing, but it is absolutely necessary to make race walking more appealing for fans and for young athletes,” he said. In addition, IAAF President Sebastian Coe echoed these sentiments. The new ideas have not been met with unanimous approval, however, with staunch opposition to the decision in certain quarters. Many athletes are not happy and some are launching a petition in an attempt to persuade the authorities to keep the 50k as an Olympic event. And Boyce is one of those who would be adversely affected by these controversial alterations. He has spent more than 10 years carefully honing his craft. As he gradually gets better and begins to master his discipline, to suddenly have all he trained for taken away is an immensely frustrating prospect. “IAAF approves changes to delete my event. RIP 50km. Anyone got any jobs going give me a shout,” Boyce tweeted during the week. The 32-year-old remains hopeful though that those in power will ultimately reconsider their decision, with the changes still a couple of years away from being implemented. And in a worst-case-scenario situation, he would contemplate switching to a shorter distance, though a successful adaptation, if one were required, would be no mean feat. ”You’re probably looking at a whole new set of criteria for even getting funded, so I could potentially lose funding if my event is changed. “If they drop it to 35, I’ll probably still have a crack at qualifying. But I’ve been training for 50k since 2007. All my training has been geared to 50k performance for the last 10 years, so to move the goalposts and make it a shorter event… I could potentially qualify in the new event, but I don’t think it would suit me. I could go from being top eight in Tokyo to maybe being back [in the pecking order] if the event is shortened. Getting rid of the 50k would also seriously disrupt the objectives Boyce has been carefully laying out for some time now, both on and off the course. “My plan would have been to try to pick up some sort of degree in the four-year period between Tokyo and Paris. I’m getting married this year and I’m after buying a house, so there are a lot of other things. Next year, for Olympic year, it’s just not feasible to have anything going on in your life if you’re trying to win an Olympic medal. So I wasn’t planning on really having a plan together maybe until after Paris in 2024. That’s where I’d see the end point. Boyce suggests that rather than drastically altering his event, it simply needs to be promoted better in order to attract more fans. “Every event needs its niche and the 50k’s niche is that it is the longest event. If you make it shorter than the marathon, I just don’t see you can take an event, make it like another event, and they expect more fans. They keep saying ‘we’re doing this to engage the fans,’ but if you promote the 50k properly, it’s probably one of the most unique events in athletics. “The unpredictability of the 50k is enormous. The last two Olympic Games, all the medalists in the 50k came from outside the lead group at halfway in the race. You’d never see that in a marathon. In Rio, you had Yohann [Diniz] going off on his own, almost had half a lap lead on everyone and he collapses twice and there’s big drama — it was nearly the most talked-about thing in the whole of the Rio Olympics. The 50k in Tokyo, because it’s a free event and the Japanese athletes are probably some of the more fancied medal favourites, you could end up getting crowds of 40,000 or 50,000 people turning up to watch. “So you have massive local interest. Yohann, who’s world champion and world record holder, has never won an Olympic medal, he’s hanging on at the age of 42 for a last-ditch attempt to win a medal. Jared Tallent, who’s medalled at the last three Olympics, trying to be the first athlete to win medals in the same event in four consecutive Games. You have huge stories to tell and I think the IAAF should focus on getting those stories out to the public. And given all this potential for great excitement, Boyce, who gets his season underway at the European Athletics Race Walking Permit Meeting in Lugano, Switzerland on Sunday, reflects with exasperation at how the present set of unfortunate circumstances have been created. “I can’t even get my head around what they’re trying to do,” he says. I don’t think there’s been any market research to say that the 30k is more entertaining for someone in their early 20s or teenagers. What’s a two-hour race versus a three-hours-and-40-minutes race? “I don’t know when the [final] decision will be made. I think they have another meeting in Doha when the World Championships are on in September or October. Email “The two-time Irish Olympian whose livelihood is under threat”. Feedback on “The two-time Irish Olympian whose livelihood is under threat”.